Well, I hate the fact that I have fallen behind in my baking & posting! It is almost that time around here to hang up the apron for a few months, since it will be too darn hot to bake here in Japan….at least without AC. We don’t have that here on base. So I am now feeling the crunch, the count down…and now I am wanting to bake like crazy of course. I mean, I’ve been wanting too anyways but I have been busy and doing other things and baking has taken a little bit of a back seat around here. 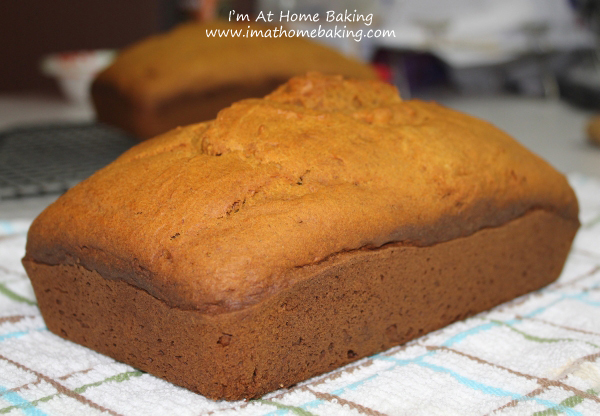 The last week or two I’ve had a hankering for Pumpkin Bread…I guess I am thinking ahead, about not being able to actually bake in the Fall, so I should get to it now, while I still can,lol. I’ve been using the same recipe my mother has for Pumpkin Bread for years now but decided to try something a little different and found this recipe. It is wonderful and perfect for all year round! What do you like to bake all year round, even if it is considered “seasonal”? Combine flour, pumpkin, brown sugar, butter, eggs, pumpkin pie spice, baking soda, salt, baking powder. Beat on medium/high speed for 1-2 minutes making sure to scrape sides of the bowl. Pour into or spoon into prepared pan. Bake 45-55 Minutes or till a toothpick inserted in the center comes out clean. Cool on wire rack for 10 minutes, remove to wire rack to cool completely.